We were in a bit of a rush in the morning before we went to Harry Potter Studios (another birthday present) so I only had time for a few quick snaps of my outfit before heading off. The red ring was my dads (hence the reason I am wearing another ring on the same finger - to keep it on because it is too big). I went for a comfy outfit to walk around all day in and it gave me a chance to wear the H&M green turtle neck which was in a previous post but haven't actually worn since then. 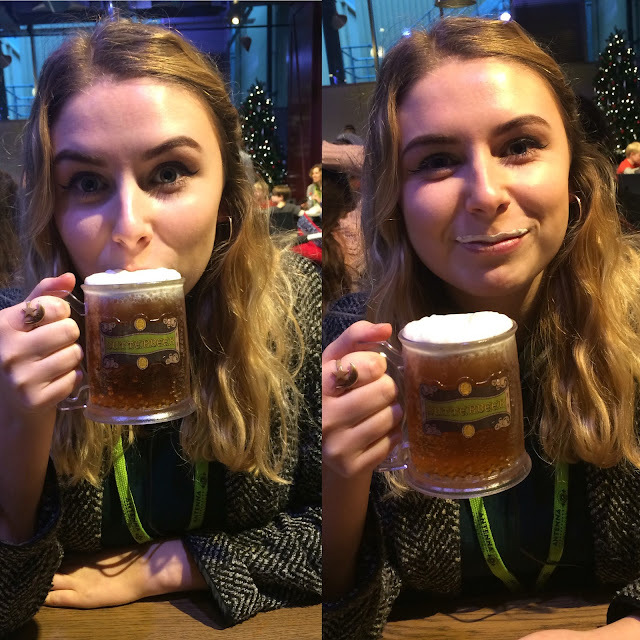 Anywayyy I was off to spend the day at the Harry Potter studios and indulge my inner geek because I bloody love Harry Potter - like who doesn't?! And it was amazinggg! I got to go when they had all the Christmas decorations up and it was just so good and got me feeling really Christmassy. I thought I would share a couple pictures of my time there and if you are a Harry Potter fan and you haven't been you need to get going! The Butterbeer froth stuff was yummmmy but the rest not so much. But hey I now got myself a butterbeer cup I can drink from until my heart is content.